MOYO, Pemba District, Zambia, Jul 6 2015 (IPS) - In the advent of unpredictable weather, smallholder rain-dependent agriculture is increasingly becoming a risky business and the situation could worsen if, as seems likely, the world experiences levels of global warming that could lead to an increase in droughts, floods and diseases, both in frequency and intensity. Neva Hamalengo, a 40-year-old farmer from Moyo in Pemba district, Southern Zambia, knows what it means to lose everything in a blink of an eye – not only did a storm wipe out an entire hectare of market-ready tomatoes worth about 15,000 kwacha (2,000 dollars), but he also suffered maize crop failure due to a month-long drought. To make matters worse, his smallholder business had no insurance cover and, admitting that he “knew nothing about insurance,” Hamalengo said that would love to see insurance education incorporated into agricultural extension services. Hamalengo’s situation represents the predicament faced by most smallholder farmers – who are generally excluded from financial services – and confirms arguments by some experts that the risk of running an uninsured business is far greater if climate is involved. While financial inclusion is considered a key enabler for reducing poverty, the statistics in Zambia are far from encouraging. According to a 2009 FinScope survey, 63 percent of the Zambian adult population (6.4 million people) is excluded from formal financial services. Slightly over half of the adult population is engaged in farming. Putting these statistics into context, the “unbanked” majority are poor people, with many of them smallholder farmers. Now, in an attempt to help them become more resilient to climate variability and shocks, the World Food Programme (WFP) has launched the R4 Rural Resilience Initiative, aimed at tackling risk in a holistic manner. The initiative is “an integrated approach to managing risk, focusing on index‐based agricultural insurance (risk transfer), improved natural resource management (disaster risk reduction), credit (prudent risk taking), savings (risk reserves) and productive safety nets,” Allan Mulando, WFP Zambia’s Head of Vulnerability Assessment and Mapping Unit (VAM), told IPS. Working with partners such as the national Disaster Management and Mitigation Unit (DMMU), government ministries, the Meteorological Department, national insurance companies, as well as credit and savings institutions, the project strives to integrate activities with already running government programmes on resilience, such as the Conservation Agriculture Scaling Up (CASU), programme. CASU, which is being run by the U.N. Food and Agriculture Organisation (FAO) in partnership with the Ministry of Agriculture and Livestock and with financial support from the European Union (EU), aims to contribute to reduced hunger, and improved food security, nutrition and income, while promoting the sustainable use of natural resources. “R4’s overall objective is to create an environment for private sector participation through market development to ensure sustainability … through insurance cover, credit provision, asset creation programmes and safety nets, as well as household saving … all of which have been identified as alternative ways of reducing vulnerability,” explained Mulando. Meanwhile, for the Ministry of Lands, Natural Resources and Environmental Protection, such initiatives are always welcome because they fall within the government’s major objective of building the capacity of local communities to adapt to climate change. According to Lungu, who is Zambia’s focal point for the United Nations Framework Convention on Climate Change (UNFCCC) , “climate change is now a cross-cutting developmental issue especially for Zambia whose economy is natural resource dependent”, with over 80 percent of the population dependent on agriculture for their livelihoods. Whereas climate shocks can trap farmers in poverty, the risk of shocks also limits their willingness to invest in measures that might increase their productivity and improve their economic situation – and this is where financial education becomes critical. Financial expert George Siameja agreed but noted that the problem lies at two levels – lack of financial education and an inhibiting credit finance environment. Meanwhile, one farmer who is singing the praises of financial literacy is 34-year-old Rodney Mudenda of Nabuzoka village in Pemba district, who has seen a dramatic change of fortunes. 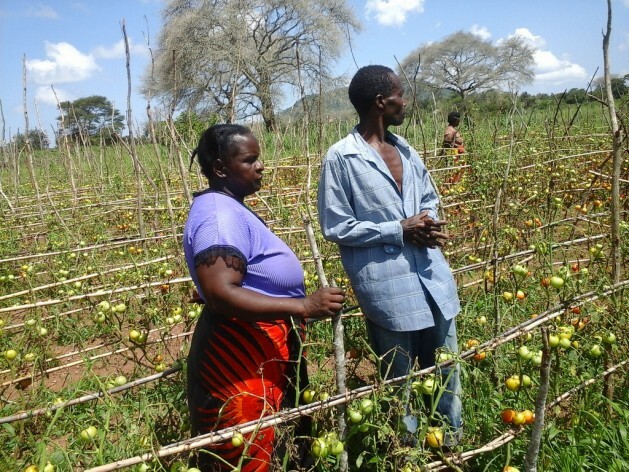 “Since I was trained in financial management last year, I have changed my approach to farming. I am ready to take calculated risks like I did this season to reduce on maize and plant more sunflowers, a drought-tolerant crop. And the gamble has paid off. I expect to earn 12,000 kwacha (1,500 dollars) from an investment of 5,000 kwacha (650 dollars)”, Mudenda told IPS. Regrettably, farmers are depicted in this article as mere recipients of support by third parties, not as actors with their own development ambitions. A telling quote: “Working with partners such as the national Disaster Management and Mitigation Unit (DMMU), government ministries, the Meteorological Department, national insurance companies, as well as credit and savings institutions…”. Incredible as it may seem, no mention is made of any kind of farmers’ organisation being involved in the R4 initiative, even though Zambia has a strong and representative national farmers’ association (the ZNFU, see http://www.znfu.org.zm). But apparently it is too scary for the WFP and its partners to consult them and/or involve them in this initiative. Or worse, perhaps they don’t even know that ZNFU exists. In other words, and unless the author of this note was incomplete and organised farmers are indeed being consulted about R4, the initiative appears to be a paternalistic one, in which the farmers and their representers do not get to have their say; the R4 partners know what is best for them. But inclusiveness is not just about designing mechanisms for, for instance, financial inclusion: it is also about including the not-included in that phase of policy design. That is: ‘nothing about them without them’. But R4 looks more like ‘everything about them without them’. A missed opportunity.